(Far right) Fred McLeod talks with students in the Center for Media Innovation at Point Park University. Alumnus Fred McLeod (COMM '74) - executive producer of multimedia, and television play-by-play announcer for the Cleveland Cavaliers of the National Basketball Association - spoke to Point Park University students in the new Center for Media Innovation Sept. 22. At Point Park, McLeod studied journalism and pitched for the baseball team, reaching the NAIA College World Series. "For the first three years of my college career, I had no idea what I wanted to do," McLeod said. "I thought I wanted to write, so I interned for the Pittsburgh Post-Gazette. Then a light bulb flashed that I wanted to pursue a career in broadcasting, and so I did." Three days after graduation, McLeod's career began as a sportscaster for KQTV in St. Joseph, Mo. Since then, he worked for more than five stations across the country before landing his job with the NBA. "When you're as embedded with a team as I am, you live it and breathe it, and I love it," McLeod said. "It's a labor of love." In his morning presentation at Point Park, McLeod discussed the business of sports with Associate Professor Steve Tanzilli's Legal Aspects of Sports, Arts and Entertainment class as well as SAEM 101 students from Montour and Westinghouse Academy High Schools. He also shared stories with the students about his career journey with the Cavaliers, the 2016 NBA Champions. McLeod told the students: "Over prepare and you will know you are always safe. You got to have an unbelievable work ethic in whatever you do Ã¢€Â¦ and you need to be a good person and have the desire and passion to be great. Only you can limit yourself. You got to believe that." "Fred McLeod gave a wonderful presentation. He spent a lot of time talking about social media and the importance of understanding and evolving with new technology. Fred also gave tips for getting into the sports industry and how to make yourself stand out during interviews, internships and resume building," explained Derek Brough, a senior SAEM major from Norwin Senior High School in North Huntingdon, Pa.
Jessica Martin, a senior SAEM major from Brentwood High School in Pittsburgh, also enjoyed McLeod's career advice. "Fred stressed the fact that it is necessary to network and meet people. He explained that working in the sports industry, you never know who you're going to meet and end up working with - or for - one day. What you can control is how you personify your personal brand and how you carry yourself," Martin said. Tanzilli added: "We really appreciated that Fred returned to Point Park to share his terrific story with our students. He is a wonderful alumnus and we were proud to host him on campus." 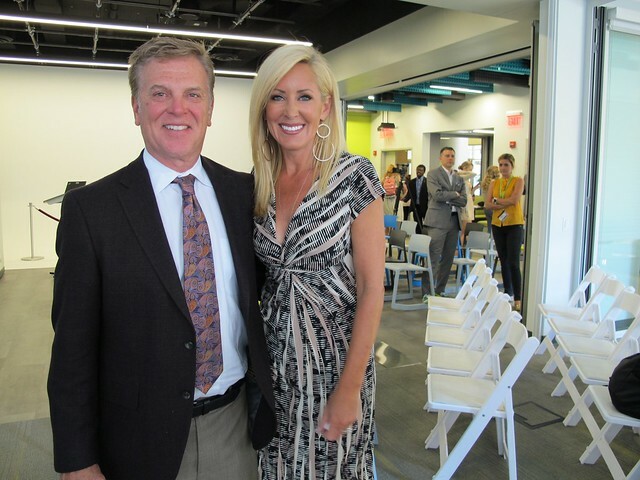 McLeod's wife Beth, an on-air personality for Cleveland 19 News, joined him for his afternoon presentation. They spoke about championship sports broadcasting, how to land an internship/job, as well as social media best practices with students in Associate Professor Thom Baggerman's and Professor Bill Moushey's Survey of Mass Communication, and Assistant Professor Paige Beal's Personal Branding and Business Development classes. "An internship, by far, is what's going to launch your career ... the students who make it in internships show up, dress professionally and always ask what they can do to help," said Beth McLeod. Kimberly Keagy, a freshman broadcast reporting major from Western Beaver High School in Industry, Pa., said learning from professionals like Fred and Beth McLeod is invaluable. "Getting advice from real-world professionals is like receiving the keys to unlock my future," she said. Brough added: "The lessons Fred provided throughout the two sessions resonated with me very much since I will be entering the job market in the coming months. I would love to follow a similar career path to him. After listening to Fred's presentations and talking with him, I feel confident I am following the proper steps to make my mark on the local market."